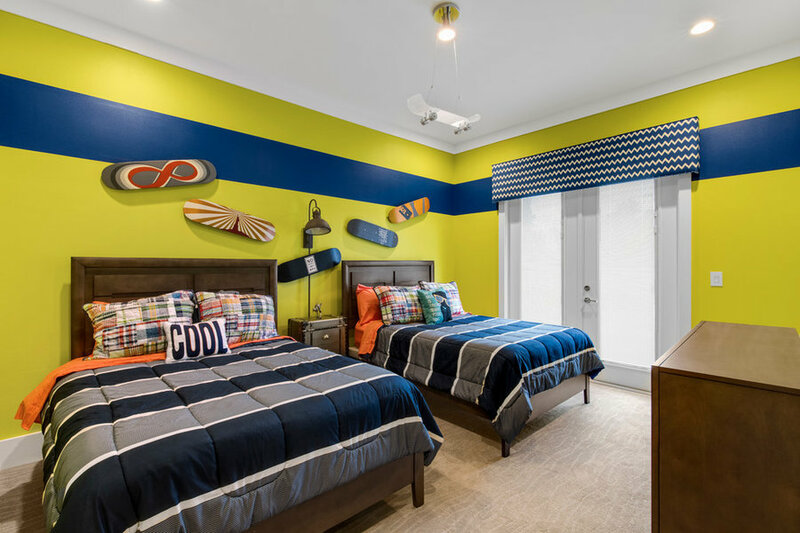 This secondary skateboard themed room is perfect for any kid/teen looking for an awesome experience. 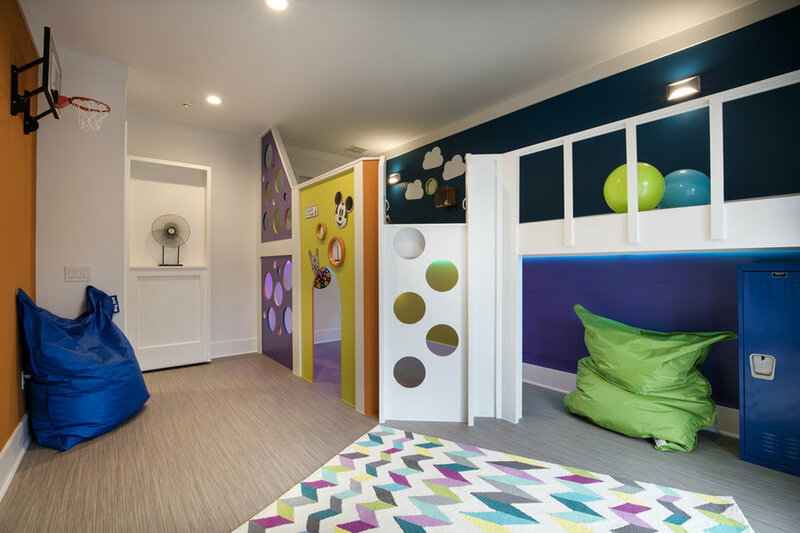 With two double beds, this room sleeps multiple and the bright, fun themed décor will make anyone want to stay. The entry way into the home is one of a kind. 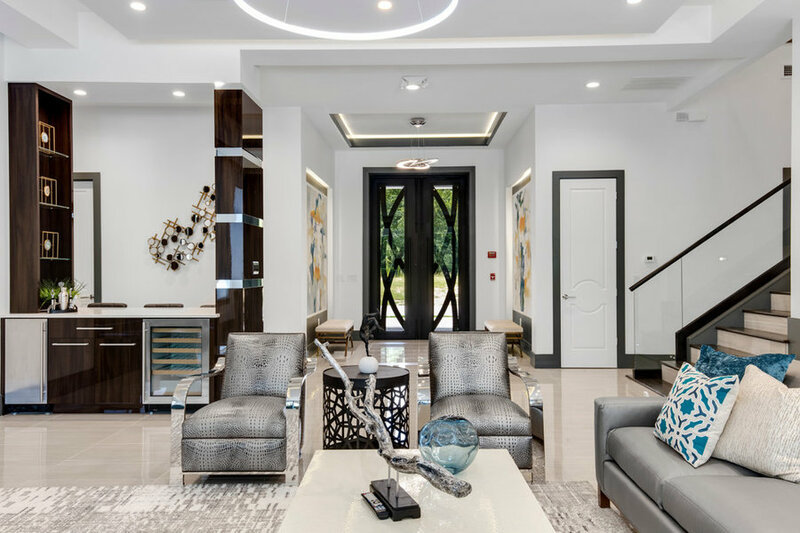 With custom designed doors, hand painted art and unique tile inlay this space leaves a lasting impression. Back lit art adds a softness to the space while packing a punch with contrast. 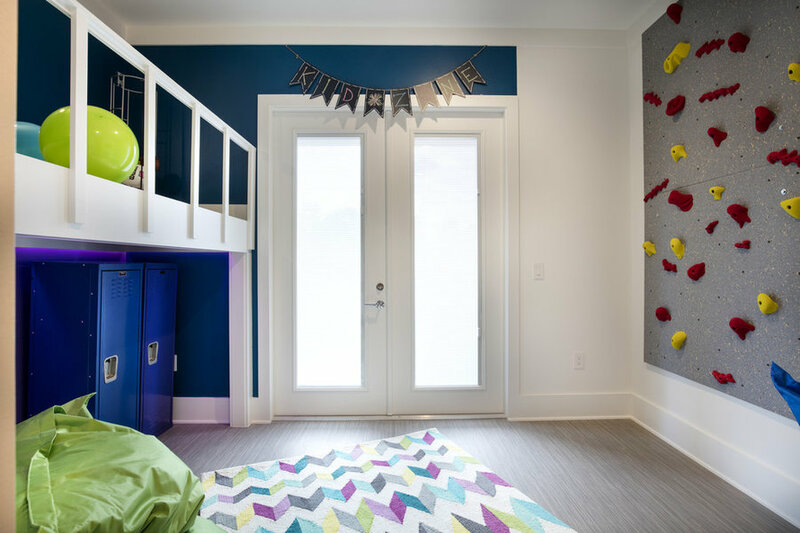 This secondary kids bunk room is perfect to bring kids together in once space. 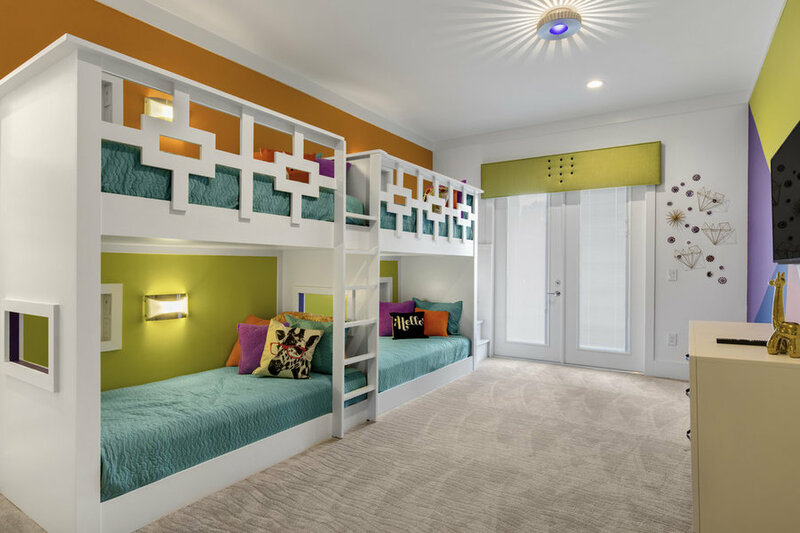 With upbeat colors this space packs a powerful punch with custom designed bunk beds, unique painting designs and fun accessories. The gathering room in this space is an open concept leading into both the kitchen and dining room. This large area provides the perfect setting to lounge on custom upholstered pieces and enjoy the unique wood paneled tv wall. 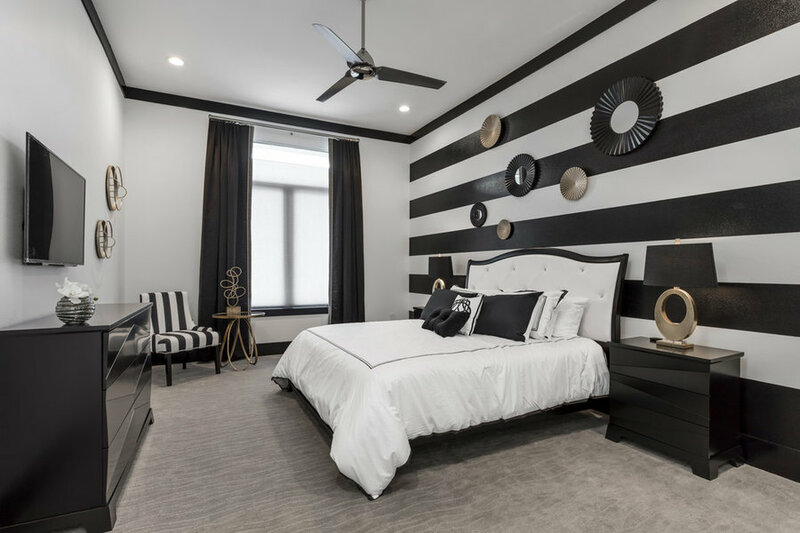 The high contrast of this space is elegant and timeless making this home one of a kind. 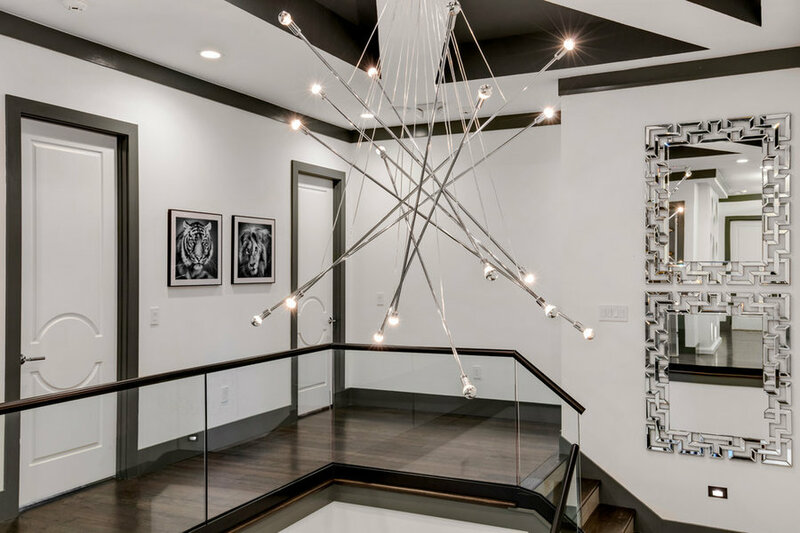 The stair foyer features a large asymmetrical lighting fixture mounted in a custom designed tray ceiling with contrasting paint. 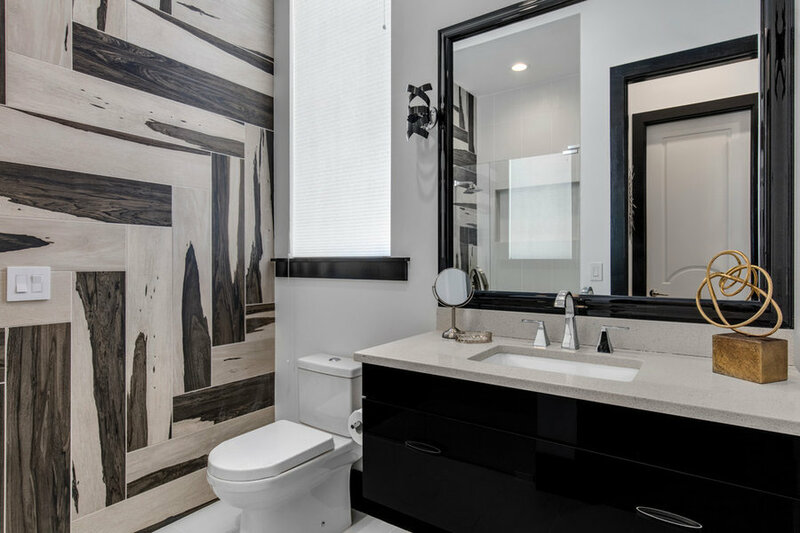 The dark trim outlines the space and stacked mirrors add reflectance and elegance. 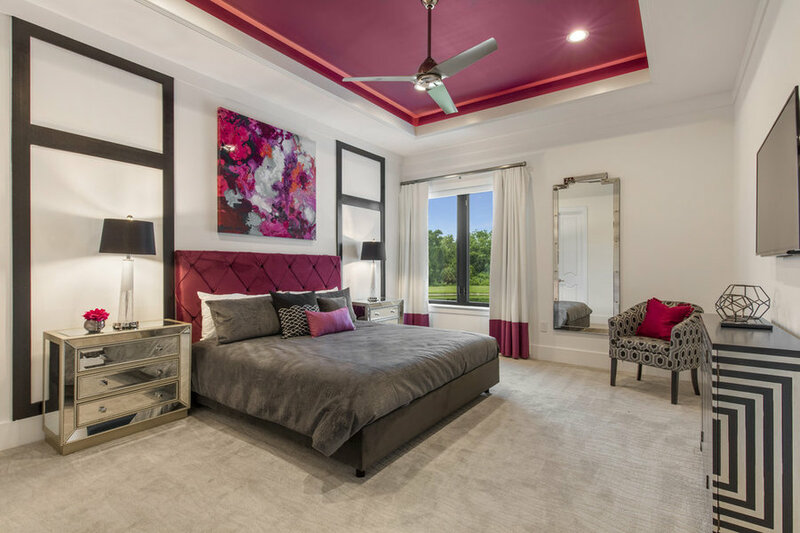 This master bedroom features and dropped soffit ceiling above the bed that is lit to give a floating effect. The white walls and black trim give the room a contemporary pop while remaining timeless. The high reflectance nightstands and mirrors add a dash of glamour. This secondary bath features custom designed shower deco tile inlay with a dash of yellow to pull everything together. 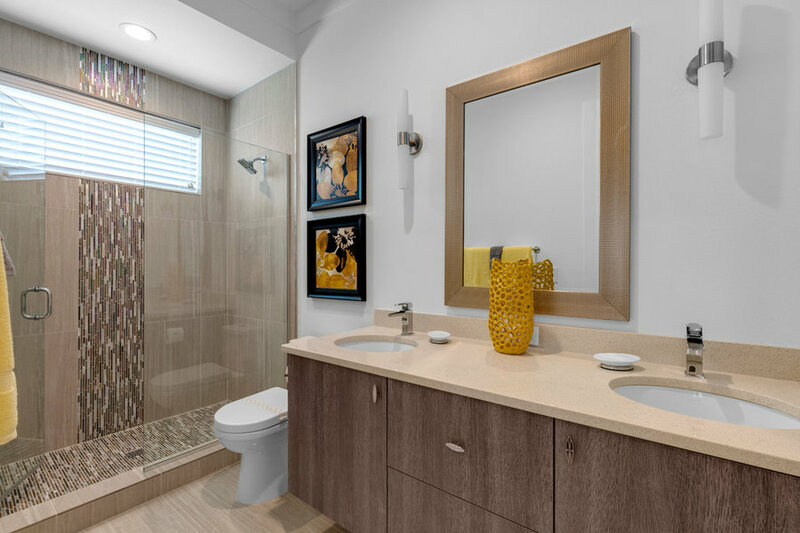 This neutral bathroom incorporates a pop of yellow for a unique feel. This secondary bedroom features two queen upholstered headboards and ottomans. 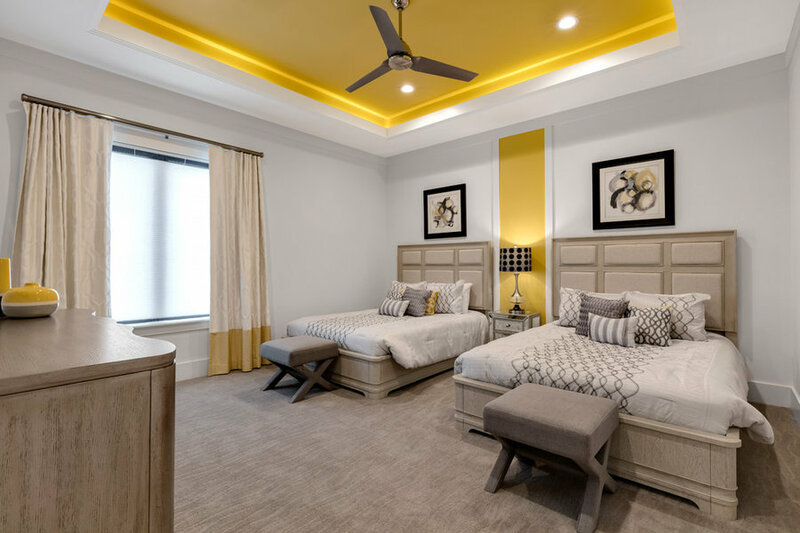 Using a yellow accent color on the ceiling wall and window treatments give the room a fun and fresh look. Black accents provide contrast and a statement. This secondary bath features a two tone tile installed on the wall in a herringbone pattern. This unique bathroom is filled with contrast with black and white elements throughout. 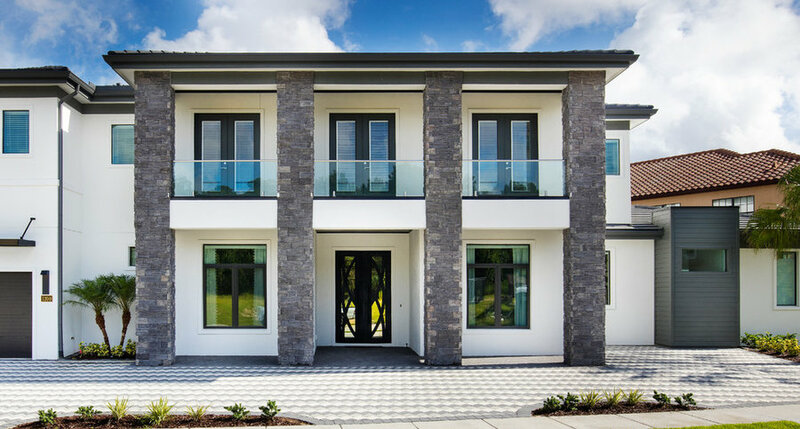 The front exterior of this home features four large columns cladded in a dark stacked stone. The white home uses black as an accent for the window trim and front door. The driveway pavers are laid in a pattern to give another custom look to the stand out home. 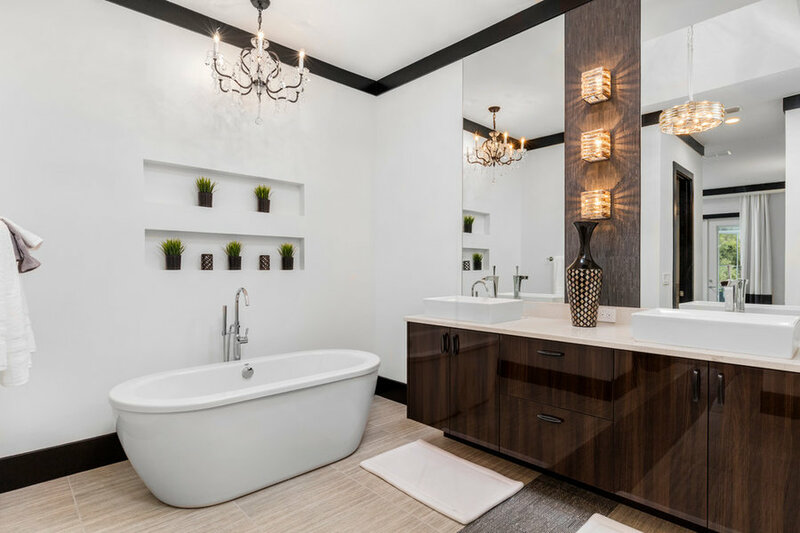 This secondary bath features a floating vanity with crystal knobs. The purple pendants add a pop of color and pull in the accent tile in the shower. The gathering room in this space is an open concept leading into both the kitchen and dining room. This large area provides the perfect setting to lounge on custom upholstered pieces and custom designed bar feature. 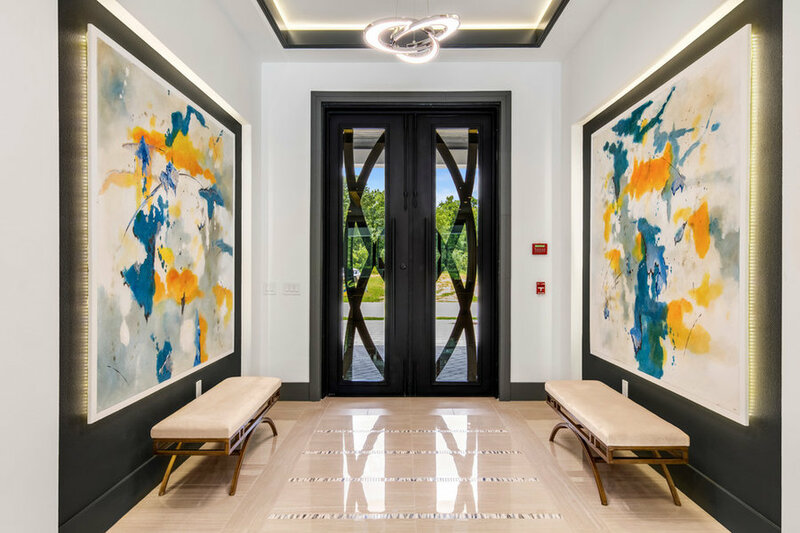 The entry way features a one of a kind door and hand painted art pieces. 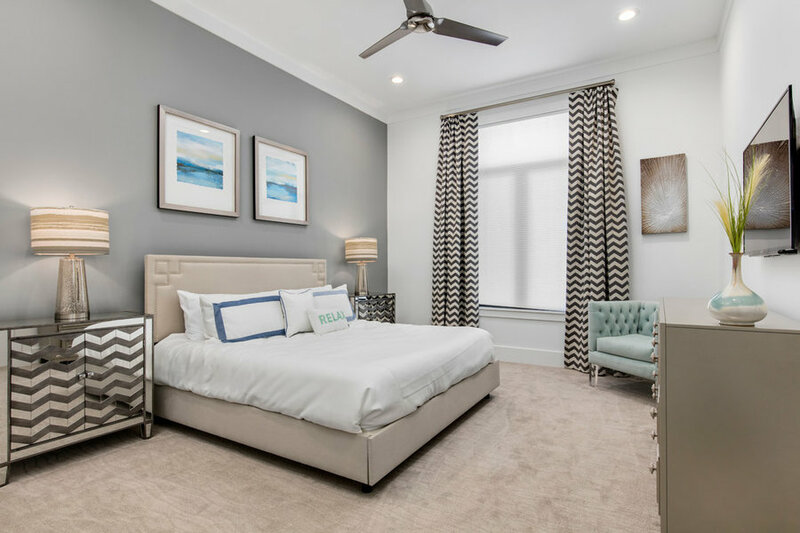 This secondary bedroom features a gray accent wall with pops of spa blue in the art, bedding and accent furniture. The 12' ceilings allow for large windows and large art. 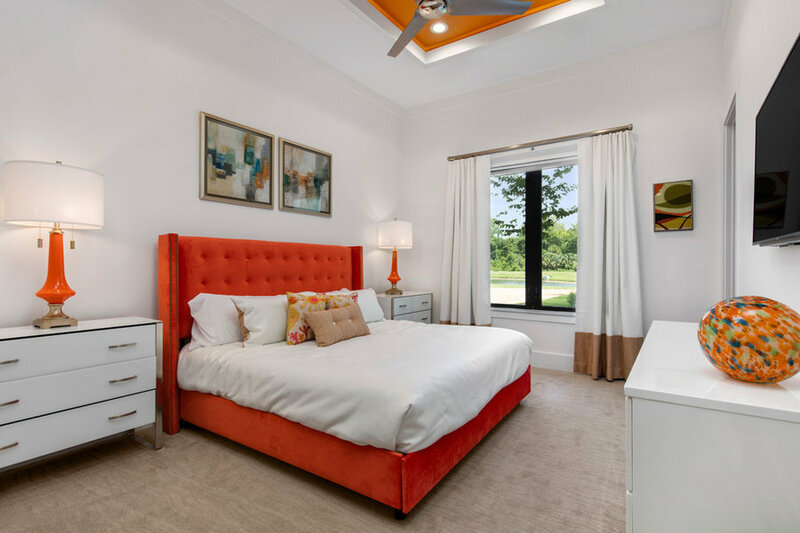 This secondary bedroom features the color orange the bed, ceiling and accessories. This bright color gives the room a youthful feel and a standout in the home. Though the color is bright the room remains calming with art and lighting. This back pool area features a large pool with hot tub and chaise lounges. The downstairs back patio has plenty of room for lounge furniture as well as a casual dining area off of the summer kitchen. The screen enclosed space provides privacy and protection. This back pool area features a large pool with hot tub and chaise lounges. The water features atop stoned pedestals give a wow factor to the pool area. The screen enclosed space provides privacy and protection. 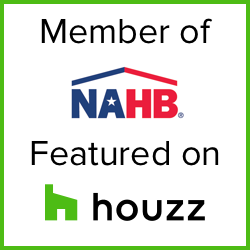 This master bath features a free standing tub with built in niches for display space. 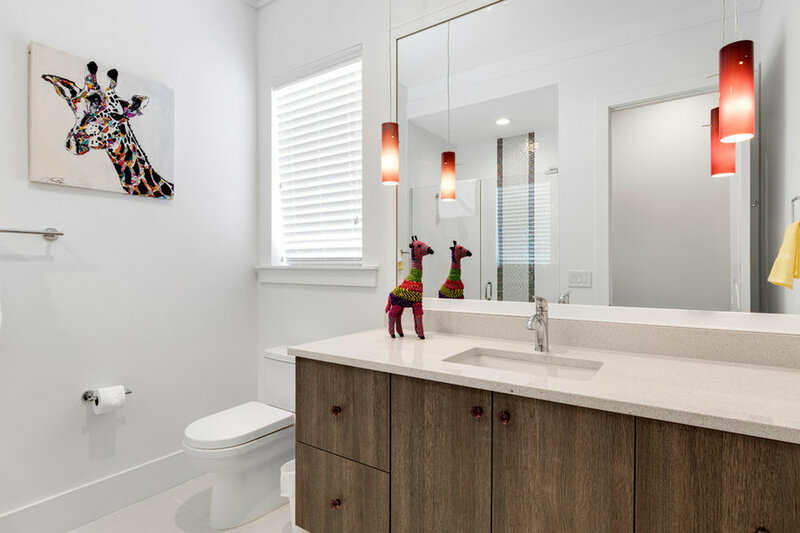 The floating high polished cabinets have pedestal sinks and a custom tile feature running from floor to wall. This sleek space give the home a contemporary feel. This patio area off the main living area features a summer kitchen and casual dining area. The lounge furniture provides space for anyone to relax and enjoy the pool area. 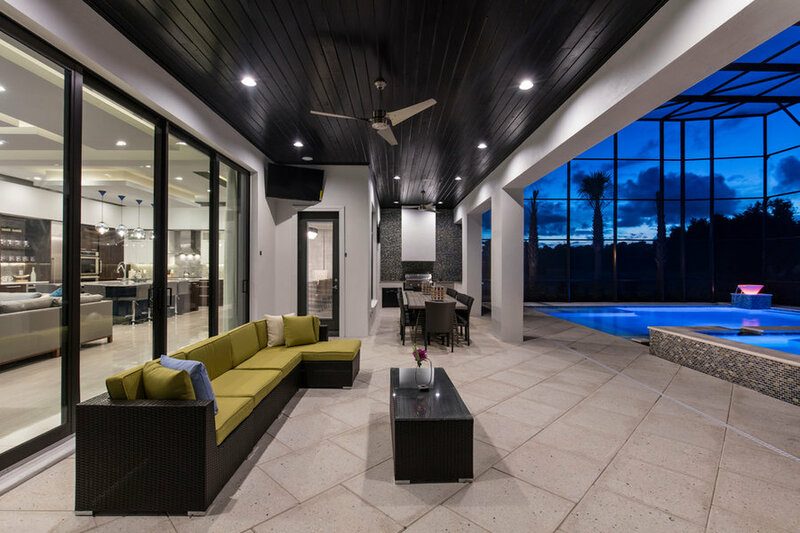 The black wood cladded ceiling contrasts with the white stucco of the home and rectified patio tile. 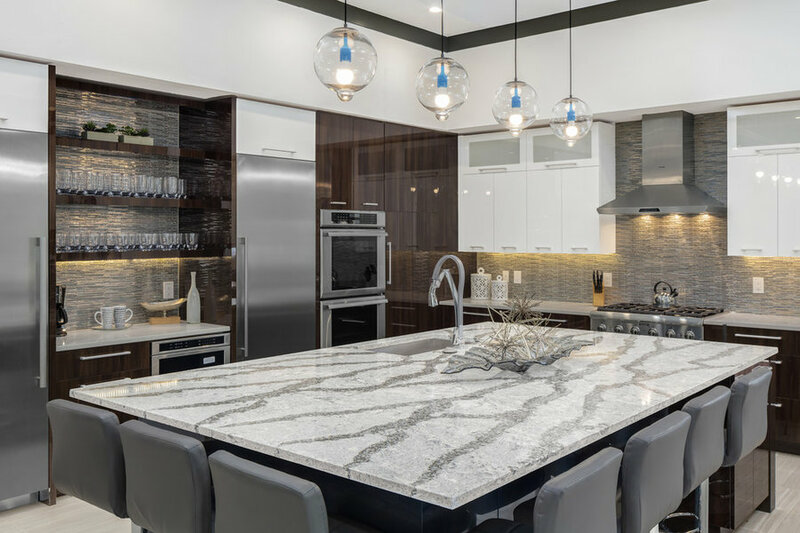 This close up of the kitchen showcases the custom made cabinets in a dark espresso, high gloss white and dark blue on the island. 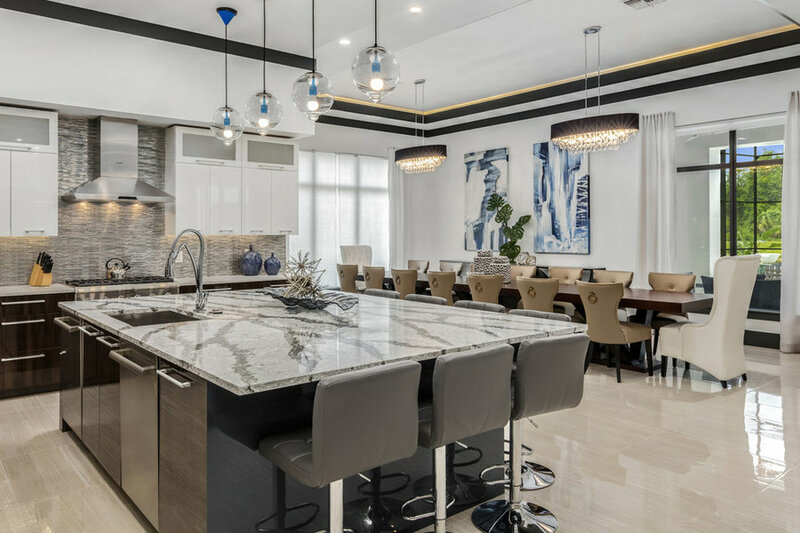 The large island, glass mosaic backsplash and stainless steel appliances make this kitchen one of a kind. This view of the kids play room showcases a rockwall, loft area for extra play space. The custom designed space is perfect for any age to play. This view of the kids play room showcases a basketball hoop, loft area for extra play space. The custom designed space is perfect for any age to play. This bunk room features custom designed bunk beds, bright colors, and fun accents. The space uses color as contrast as well as shape and texture. This bunk room is perfect for any age. 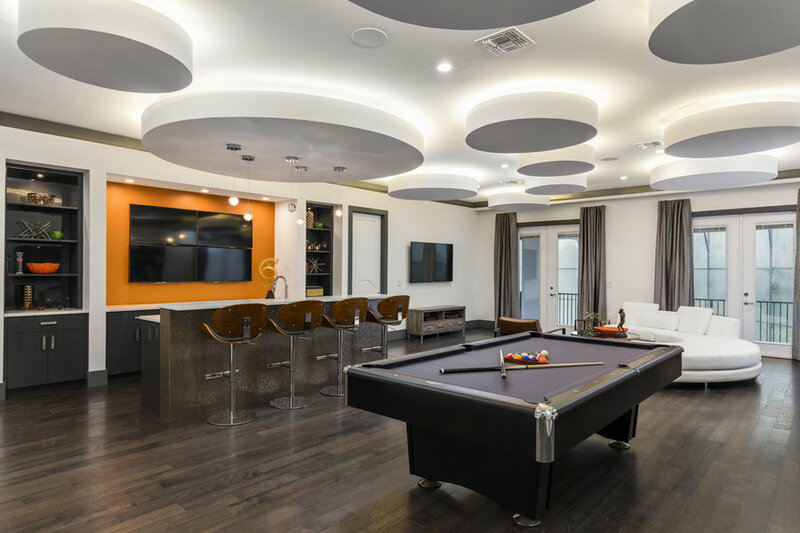 This secondary gathering area features a home bar that uses an orange accent wall to set the mood for the space. The custom designed ceiling gives the space a unique character and charm. 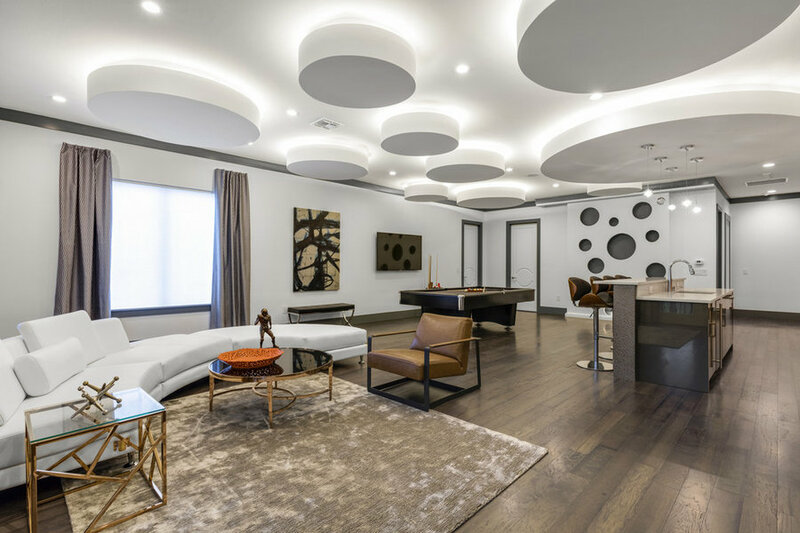 A circular sofa plays off the rest of the ceiling and adds another piece of interest. This view of the kitchen and dining room shows the open concept as well as the small details that pull the space together. The dark trim outlines the space and adds contrast. 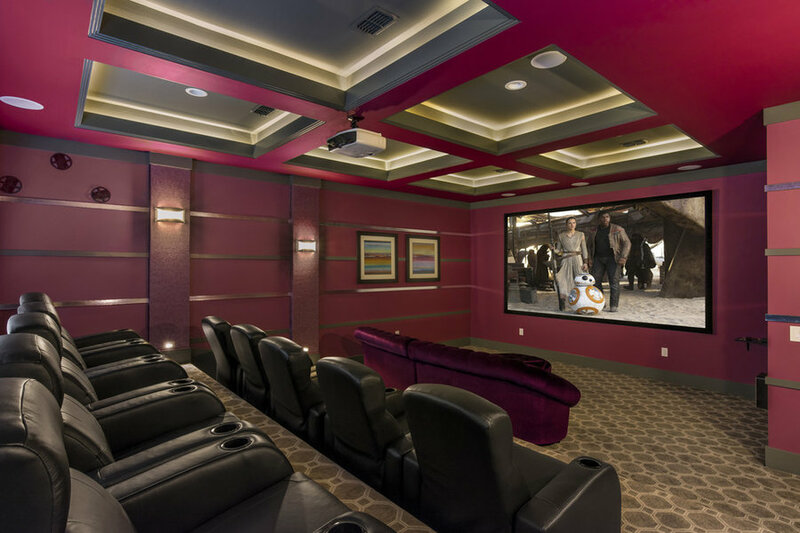 With plenty of seating and ample lighting this space is great for entertaining. 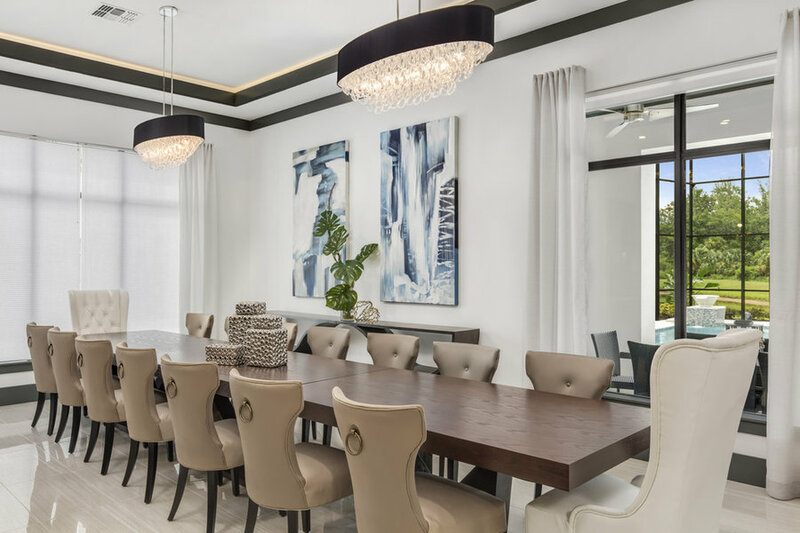 This dining room features two large pieces of coordinating art, large dining tables to seat sixteen and asymmetrical console tables. This modern space is complemented with two chandeliers to add a timeless appeal. This master bedroom features a custom upholstered headboard on a textured wallpaper wall. 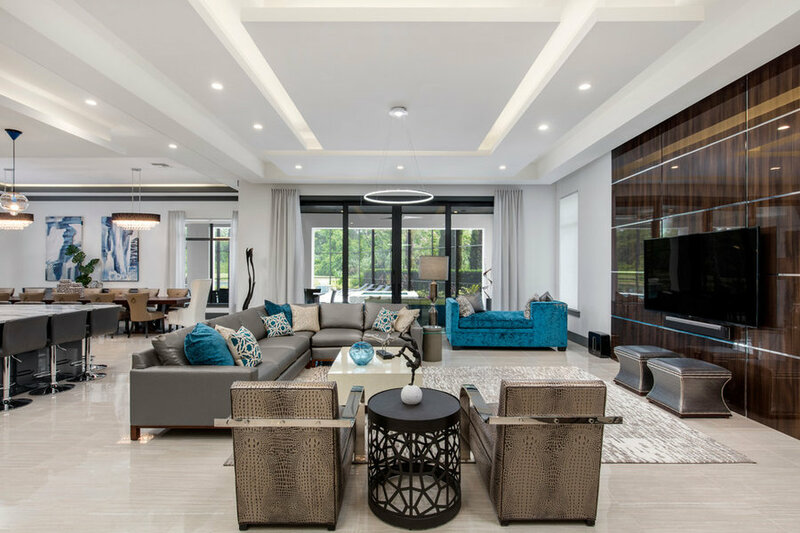 The space used pendant lights of the nightstands to add a contemporary feel, and they are paired with a large chandelier near the seating area. 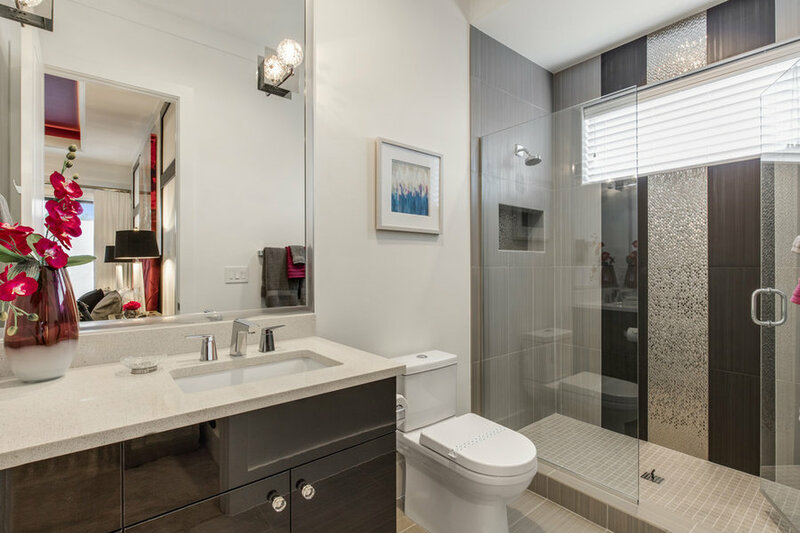 This master suite bathroom showcases a glass enclosure shower with textured wave tile, black trim, free standing tub and crystal light fixtures. This is an elegant yet contemporary space designed to leave an impression.